Kasich With all that was happening on this Sunday afternoon, it was pretty easy to have missed Governor John Kasich addressing the NAACP Convention in Cincinnati. It’s less than 15 minutes and worth your time, the Governor is pragmatic and thoughtful. Republicans need to do more of this. I was recently interviewed for this piece by business and IT writer Debra Donston-Miller about Big Data and 2016. I’ll have more to say about the subject soon enough, but for now, enjoy this article. If big data was something of a secret weapon during the presidential election of 2012, it promises to loom large as we run up to 2016. There’s no doubt that big data is playing an increasingly big role in business, politics, healthcare, education, retail and numerous other industries. With the right tools and expertise, organizations can slice and dice data to reveal trends and other information that will inform decisions about future strategy and direction. During the 2012 election, big data was used to great advantage—namely, by Barack Obama, in his re-election campaign. Cukier said campaigns have always been run on information, but in 2012 big data helped optimize that information and activities around it. The role of big data will only increase in the 2016 presidential election, with practitioners using technology to hone in on data much more granularly than ever before. In addition, say experts, the use of big data will overlap with social media and other platforms. Pay attention to some of the hotly contested issues and the preparation for 2014 Senate elections, and you will see big data at work and a preview of what’s to come in 2016. All of this is not to say that the process will be easy. Analysis of big data is a highly complex task, and at this point in time it requires a very specialized—and often expensive–skill set. Luckily, technology providers are heeding the call for products and services that can tame the big data beast. Indeed, said Cukier, two of the biggest barriers to big data are narrow thinking and a dearth of leadership. Tuesday Hugh Hewitt interviewed Newt Gingrich for what turned out to be 3 segments. Below you will find all 3 parts of the interview. 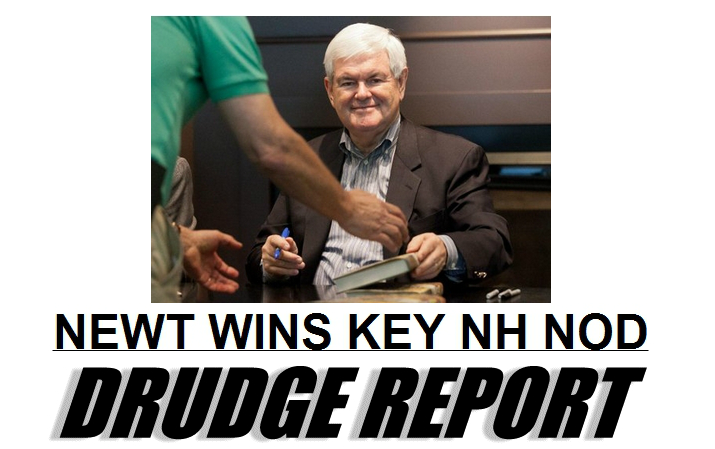 Sunday has been a very good day thus far for Newt Gingrich. Take a look at today’s New Hampshire Union Leader Endorsement. I’ve put together a small report on the whole situation over at US Daily Review. I suspect Fargo Bachmann is sharpening her knives yet again, trying to figure out what else she could inaccurately accuse Newt Gingrich of. Fargo Bachmann has become a joke, she has been in freefall since her Iowa victory, but in reality, the field was not set in Iowa. Fargo Bachmann also had about 12 people show up to her Iowa book signing in Iowa on Saturday. She and Team Fargo blamed this on a publisher mixup. Oh well. >Do we really need 5,100 more IRS agents? President Obama’s fiscal 2012 budget doesn’t cut much of anything (see above), and certainly not the Internal Revenue Service. The White House is requesting that the most beloved of all government agencies get an additional 5,100 agents next year, no doubt to wring further tax revenue from Americans. The White House wants to give the IRS a 9.4% raise in fiscal 2012, to $13.28 billion. Reuters reports this would allow for a roughly 5% increase in agency manpower to 100,537, including $460 million more for tax enforcement than in 2010. I’m not for more government, but I will advocate for a big government idea to make a larger point. What if instead of hiring 5,100 new IRS agents, the government instead gave 5,100 people $500,000 under the watchful eye of the Small Business Administration, and let them go out and create real jobs, and real wealth in America? We could play with the numbers one way or the other, at the high end this is $2.5 Billion. $250,000 instead would be $1.25 Billion. Something like that would be a real stimulus, not creating more government workers. So many people are documenting their thoughts about Ronald Reagan on this, his 100th birthday, so I will give in to the temptation and offer some of my memories as well. My earliest memories of President Reagan go back to my third grade year. One of my best friends at the time (Mike M., he knows who he is) and I stood up in front of our class and each recited the 40 Presidents at the time, in order. And of course, at that time Reagan was the 40th and last President. Mike M. and I both got extra credit for doing this, and we were the only two in the entire 20-25 student class to do this. Our third grade class wrote letters to the White House when we were studying the Presidency. Each student who mailed a letter, received a package in the mail which contained an 8×10 of President Reagan (the now infamous bust shot of Reagan with the American flag in the background), a book/magazine about the White House (a book/magazine that I still have to this day) and a letter from the President thanking us for writing and encouraging us to study further. Yes, I realize this was not a personal letter, but the 8×10 got thumb-tacked to my bedroom wall, how many third graders can say that? What can I say, I always thought President Reagan looked cool. He was the same age as my grandfather, and I thought that was cool too. My grandfather would have been 100 later this year, I’ll write about that in due time. In 1984, my classroom did a secret ballot vote for Reagan vs. Mondale. The 22-1 defeat I suffered that day was made better when I read about the landslide victory the next morning on the front page of the San Antonio Express-News. I’ll take 49-1 across the country every time. Finally, I remember President Reagan speaking to the country the day the space shuttle Challenger exploded. My class at the time was watching tv live when the shuttle took off, as we were studying astronomy and all the teachers in America were especially intrigued with Astronaut (and teacher) Christa McAuliffe being on that space flight. I remember President Reagan speaking to the country, and especially singling out the students of America, practically talking directly to us. Again, it was like grandpa was speaking right to me. I was an adult when President Reagan revealed he was suffering from Alzheimers. I was living in Georgia, working on a congressional campaign, when the President died in 2004. I have been to the Ronald Reagan Presidential Library in Simi Valley, California, three times, the first time being in 1999. I have even visited the Library there as a researcher, where I was able to look at papers from the archives. I have twice been able to stand where the President is buried, where he will forever face the sunsets in the west, when the sun drops below the mountains of Simi Valley at the end of each day. Anyway, those are my recollections for this momentous day celebrating a momentous man.